T/N: Yu Kigoshi, born 1981. 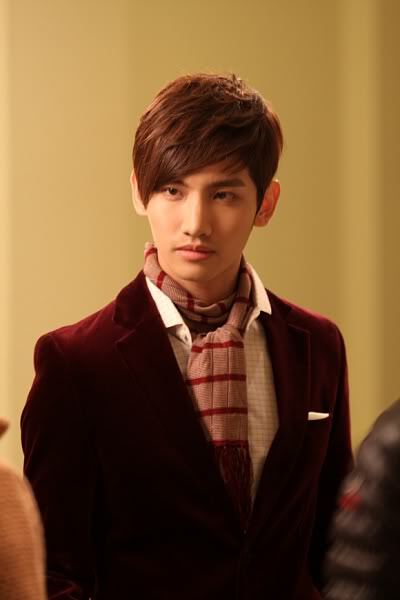 He is a writer in a publishing company, and also the author for the books “The Secrets of Tohoshinki Part 1” and “Part 2”. 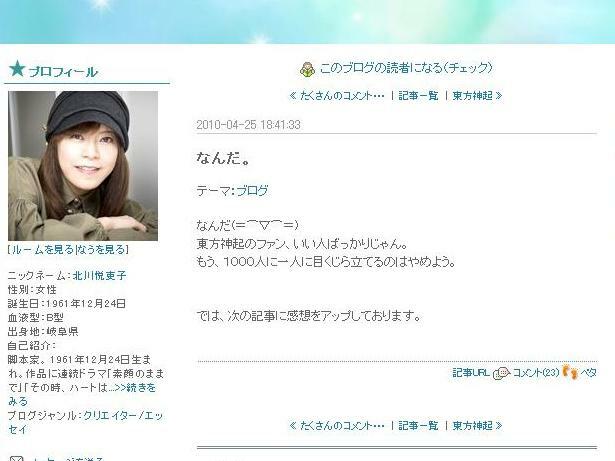 Some of our friends should remember that he collected encouraging comments to send to Yunho and Yunho’s father in Dec 2009 – Jan 2010. 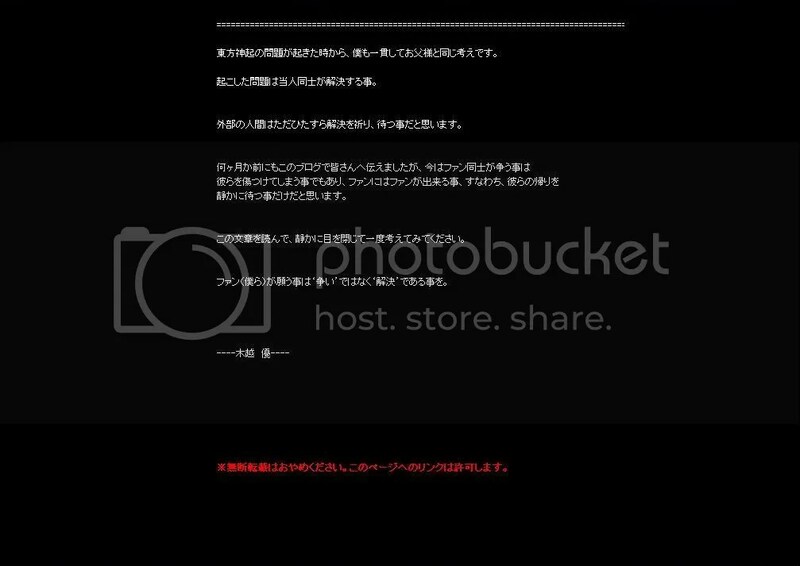 There should be many that have shed their tears hearing the news of the “suspension of the activities”, and waiting with all their hearts of the comeback of Tohoshinki. Yesterday (T/N: April 13), I have contacted Yunho’s father for a few times, and received his message. 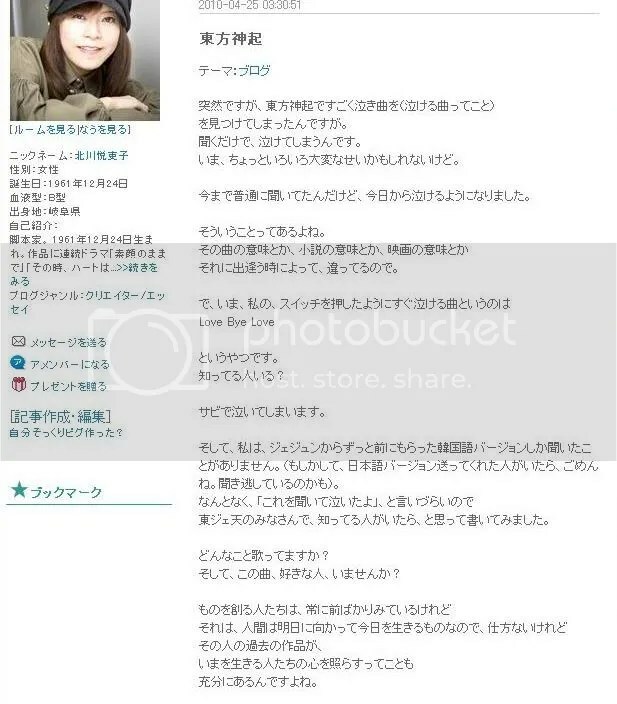 There was a request from Yunho’s father to disclose his message in my blog in both Korean and Japanese. 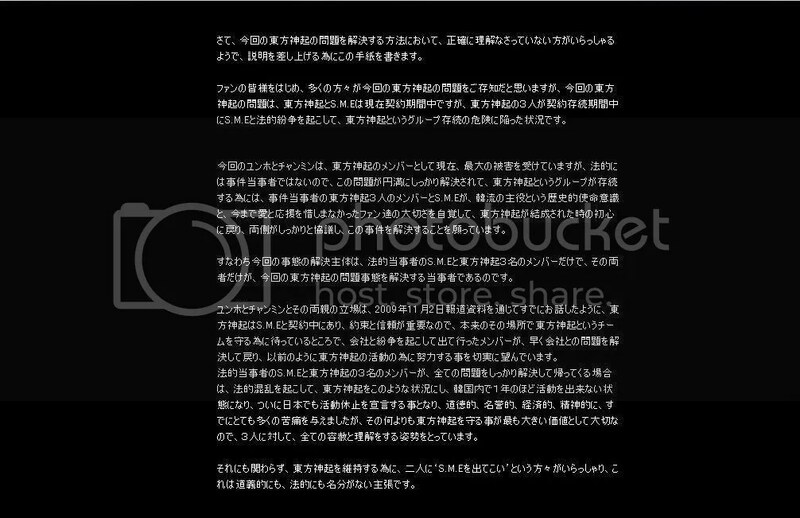 The Korean message was written by Yunho’s father himself, and I have translated the message into Japanese. *Since I am not a professional translator, I had my friend who is a professional translator confirm the contents. Thank you Kigoshi Yu for your letter. Although we were planning to meet when you came over to Korea, unfortunately I was unable to get time off from work, so we have put it off until next time. When we were supposed to meet, you were going to tell me how the Japanese fans want TVXQ to continue. I, too, am praying that this problem will be resolved quickly, and that TVXQ can once again resume their activities not only in Korea, Japan, and Asia, but also worldwide. However, it has come to my attention that there are many people who has the wrong idea about this matter; that’s why I am writing this letter with hopes of explaining it, even if just a bit. Fans and many others are aware of the case with TVXQ. This is about the three members of TVXQ who are in a contract with SM Entertainment, and during the contract period, are embroiled in a legal dispute which has put the whole group (TVXQ) into jeopardy. The members of TVXQ who are not involved in the dispute, Yunho and Changmin, are receiving most of the damage and they are hoping that this incident will be satisfactorily settled for TVXQ’s continuation. They wish that the members involved and SM Entertainment would be aware that they are leaders in the Hallyu wave, and would think of the love and support from their fans up to now, and return to how they were in the beginning so that they could come to an agreement and resolve this. This situation can only be resolved by SM Entertainment and the three members who are involved in the legal dispute. 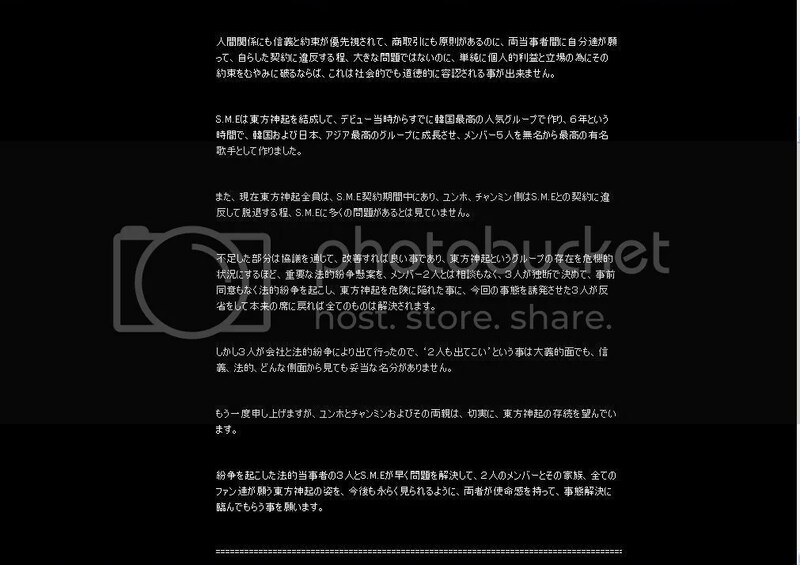 As Yunho, Changmin and their parents have already stated in the press release on 11th of November 2009, TVXQ has a contract with SM Entertainment, and because we believe that promises and trust are important, we are waiting, in order to protect TVXQ. If everything gets settled and the three members do return, they have still endangered TVXQ as a group, and have prevented them from doing any activities in Korea for a year, and finally, they have had to stop activities in Japan as well. In doing so, they have inflicted much harm in the moral, financial, reputational, and psychological aspects. However, because the most important thing is to protect TVXQ, we are willing to forgive and understand them for their actions. It seems like there are people who think that in order to keep TVXQ together, the other two members must leave SM Entertainment. However, there are no moral or legal rights that will prove this claim. In human relationships, your faith and promises become a priority, and there are principles in commerce/deals. If both sides agree to something, and there are no big problems, it is socially and morally unacceptable for you to thoughtlessly break that promise for your own gain. SM Entertainment has made TVXQ the most popular group in Korea from the very beginning, and over the past six years have enabled them to become top artists in Korea, Japan, and the whole of Asia. They have turned the five members from an unknown group to top artists. Also, TVXQ members are all bound to a contract, and Yunho and Changmin do not think that there are enough problems with SM Entertainment to breach their contract, and leave the company. If there are parts that need adjustments, they could have talked it over to improve it, but they didn’t take into account of the other two members, and filed a lawsuit which has threatened TVXQ’s very existence. If the three who instigated this legal dispute reflect on their actions and return to their original place, everything will be resolved. However, the three went on with it, and no matter how you look it at, there is no just cause in asking the other two to leave as well. I’m aware that I’m repeating myself, but Yunho, Changmin, and their parents only want the continuation of Dong Bang Shin Ki (Tohoshinki). I hope that the three members and SM Entertainment, who are involved in this legal dispute, will quickly resolve this problem so that TVXQ can resume their activities now, for the long run, like how the two members, their families, and all their fans wish for. Ever since the problem of Tohoshinki occurred, my way of thinking is the same as that of Yunho’s father. The problem raised should be solved by the ones who have caused them. The outsiders should just pray for the settlement, and wait quietly. I have written in this blog a few months ago, but the conflict of the fans may hurt the members. The fans should do what they can, that is, to wait quietly for their comeback. After reading this message, please close your eyes and think once again. What we fans wish are, not conflict, but settlement. I just found a song of Tohoshinki that makes me cry (a song that gives me tears). Just hearing the song, I am in tears. Well, it may be that I am through some difficulties now. Until today, I was just hearing the song. But from today, the song gives me tears. to you by the timing you meet the works. This is the name of the song. 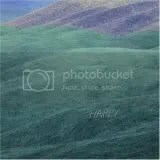 Does somebody know this song? I am in tears hearing the climax of the song. And, I only have in my hands the Korean version that Jaejoong gave me a long time ago. 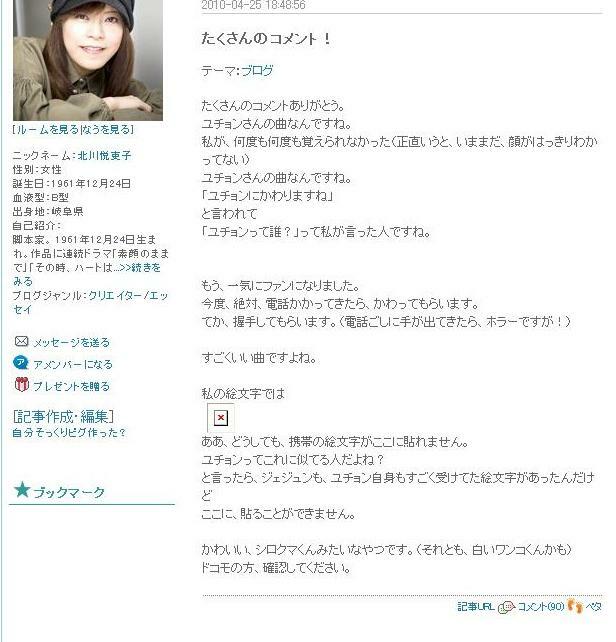 so, I am seeking information from the ToJaeTen (T/N: Tohoshinki + Jaejoong + Tengoku, meaning the Tohoshiki fan subscribers of Kitagawa-san’s blog) members. What are the meanings of the lyrics? And, are there any people here that love this song? that is because we humans are looking straight forward to the “tomorrow” and living the “today”. It is natural. But there are times when the person’s past works gives light to the people living now. I was always looking straight forward. Tohoshinki fans are all kind. I will not be angry with the only 1 unkind person, only 1 in 1000. So, I will write my impressions in my next article. So it is Yoochun-san’s song. It is sung by the person whom I could not remember his name many times. Oh, I am suddenly a fan girl. 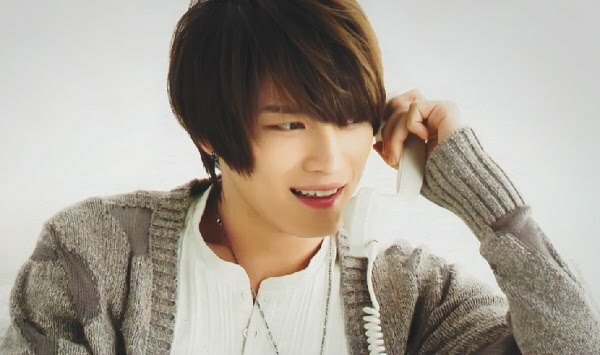 The next time, definitely, when there is a phone call (T/N: from Jaejoong), I would request that he change to Yoochun. It is truly a lovely song. Oh, I cannot post the pictographic here. Yoochun should look like this, don’t you think so? When I said this, both Jaejoong and Yoochun laughed aloud. But I cannot post it here. For those who are using the Docomo cellular phone, please check. Hero JaeJoong (Kim JaeJoong), who officially debuted as an actor in Japan, has given a stable and wonderful display of acting skill. Hero JaeJoong debuted as an actor in the new drama ‘Sunao ni Narenakute’ which began airing on the 15th of April 2010. This is a drama that’s based on love and friendship through the social networking site Twitter. In episode 2, he introduced himself as a ‘doctor’ though he’s a struggling pharmacy equipment salesperson. On top of that, the scene where he confessed his love to Ueno Juri by saying ‘I like you’ in Korean has excited many viewers. There are comments like “His acting skill is much better than expected,” “Hero JaeJoong is mine,” “His acting skill is on par with Ueno Juri and the rest, no lagging behind” among the viewers.